We provide made-to-order treadmills optimized for rehabilitation. Ohtake Root Kogyo also produces many treadmills optimized for walking practice and rehabilitation. These stabilize at slow speed, which is difficult with other treadmills, having a lower height, more adjustable handrails, etc. We also manufacture special products such as a treadmill for pets rehabilitation. This product enables dynamic measurement using a force plate in a limited space such as indoors. To accurately measure force plate data, the force plate is placed under a belt. It thus directly receives forces of the user walking and running. It is completely made in Japan. They can change the specifications according to requests: add a belt control program, change belt as needed, etc. (from Tec Gihan website). "Low floor, split belt type"
Treadmill walking is an effective improvement exercise for a walking disability. There is also treadmill walking analysis to evaluate walking, for clinical use. However, many people don’t have such concept, because ordinary treadmills are not made for walking practice, making them inconvenient in various ways. They are high above the floor, making it more difficult to get on and off. Speed is not stable when very slow (1 km/h or less). Insufficient size of the walking surface (front to rear, left to right). Handrail height and width are not adjustable enough. The low height type independent right and left belt treadmills of Ohtake Root solve these problems. These are optimum treadmills for walking exercise and walking evaluation. Left and right belts can be controlled at different speeds, making it possible to create a “different stride lengths walk” which is impossible otherwise. It proves useful in hemiplegia walking practice, etc. As an option, you can add a suspended walking aid device (Load Relief Type Rehabilitation Lift SP-1000: Moritoh Corporation). 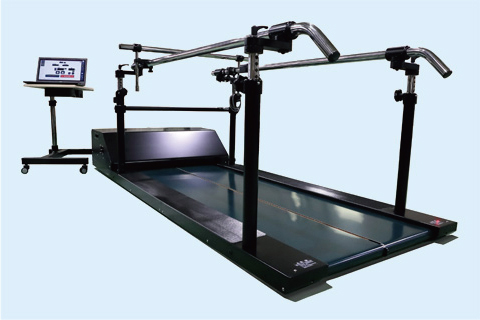 Also, using a treadmill walking analysis system (KinemaTracer: Kissei Comtec Co., Ltd.), walk analysis for clinical use can be performed easily. Out university has been developing a comprehensive walking assessment - practice system since 2002. As part of this, we need a treadmill that fully takes into account the characteristics of walking disabilities, and joint development of an Ohtake treadmill (DLF-55 / DLF-55E) began in 2007. The following five main features are good for clinical use. 1)Optimal belt size: Sufficient length and width encourage natural walking. 2)Low height: Even people with a walking disability can get on and off easily. Can also embed in the floor. 3)Easy handrail adjustment: Can adjust handrail height/width to optimal position. 4)Stable, low speed drive: Can practice from 0.1 km/h, and can use for severe walking disability cases. 5)Right and left separated belts: Practice at different left and right speeds is useful for people with asymmetry in walking, such as hemiplegia.